One hundred and fifty troops of the Ghana Independent Infantry Company (GHANCOY 1) serving with the United Nations Mission in South Sudan (UNMISS), have been decorated with United Nations’ medals at the Mango Camp in Aweil, South Sudan, for their contribution to the peace process in Africa’s youngest state. The personnel of the company, commanded by Lt Col Felix Kwaku Mautsueni, were awarded the medals after passing the three month mandatory duration of qualified service in the mission. UN military observers and police personnel in Aweil, who had met the requirement, were also decorated with peace medals. The UNMISS Sector West Commander and Guest of Honour for the ceremony, Brigadier General Wang Chuanjin commended the zeal of GHANCOY 1, which had seen it excel in the operational area. In a telephone interview with Captain Maxwell Michael Asola-Fadola, the GHANCOY 1 Press and Information Officer (PIO), Brigadier General Chuanjin lauded the troops for fulfilling its assigned tasks professionally. Brigadier General Wang Chuanjin, Captain Asola-Fadola said, indicated that GHANCOY 1 had dominated its area of responsibility through robust patrols conducted day and night, manned observation posts, airport security and force protection tasks to both military and civilian members of UNMISS and humanitarian partners in the Aweil State and the Northern Bahr El Ghazal region as a whole. He added that the hope offered by the revitalised peace agreement between the government and warring factions in South Sudan called for even greater efforts to maintain peace and stability in the country, therefore, there must be increased engagements and support to ensure the success of the peace process. The Sector West Commander, finally, congratulated the Ghanaian Contingent Commander, Brig. Gen. Albert Kwadwo Dawohoso, and troops of the company for earning the UN Medals and urged them not to renege on their efforts to bring lasting peace to the people of South Sudan. 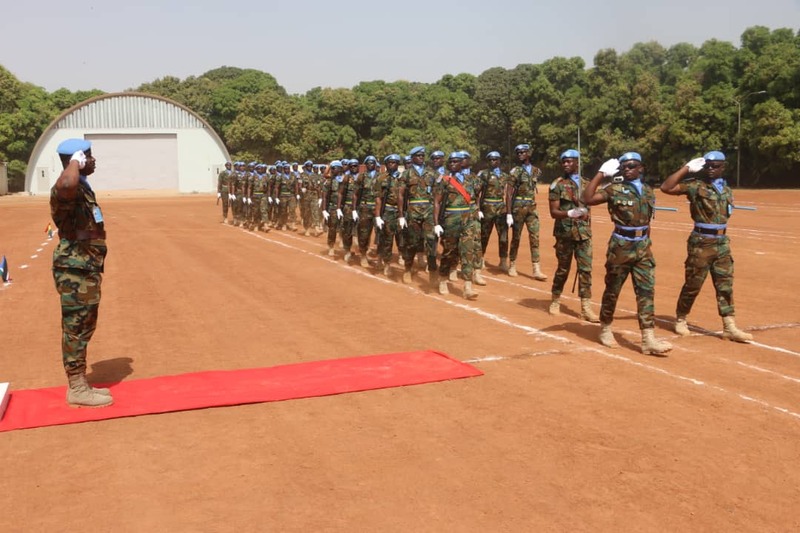 The UNMISS Sector North Commander, who doubles as the Ghanaian Contingent Commander, Brigadier General A.K Dawohoso, and the Head of UNMISS Aweil Field Office, Mr Ataklti Hailu, were the Special Guests for the occasion. The UN Medal is an international decoration established in 1950 by the Secretary-General to be awarded to military and police forces who are, or have been in the service of the United Nations in operations such as peacekeeping, humanitarian efforts and disaster relief. 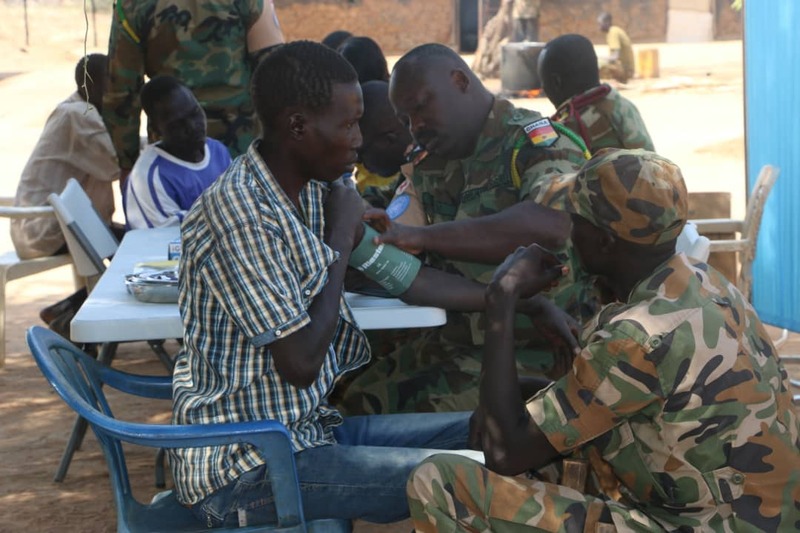 Earlier, GHANCOY 1’s medical team undertook a medical screening exercise for inmates of the Lion Division Main Prison, also known as the Loki Prison, the 3rd Division Headquarters of the South Sudan People’s Defence Force (SSPDF) at Wunyik. The exercise, which formed part of the Civil Military Cooperation (CIMIC) agenda of GHANCOY 1, was led by Captain Bennet Danquah, the Medical Officer of the Company. The team diagnosed the medical conditions of inmates of the military detention facility, as well as provided medication for the treatment of the diseases diagnosed. The exercise was conducted in consultation with UNMISS Aweil Human Rights cell headed by Mrs Eki Gbinigie and was also to ascertain the living condition of inmates in the Loki Prison, in relation to the United Nations Human Rights standards of incarceration. And Captain Asola-Fadola explained that all 29 inmates of the prison facility were screened and treated of various health conditions as well as some wardens. The GHANCOY 1 Chaplain and CIMIC officer, Lt Christenoph Nketia-Yamoah, Captain Asola-Fadola said, shared a word of prayer with the inmates and asked for God’s mercy, favor and protection upon their lives even as they are imprisoned. 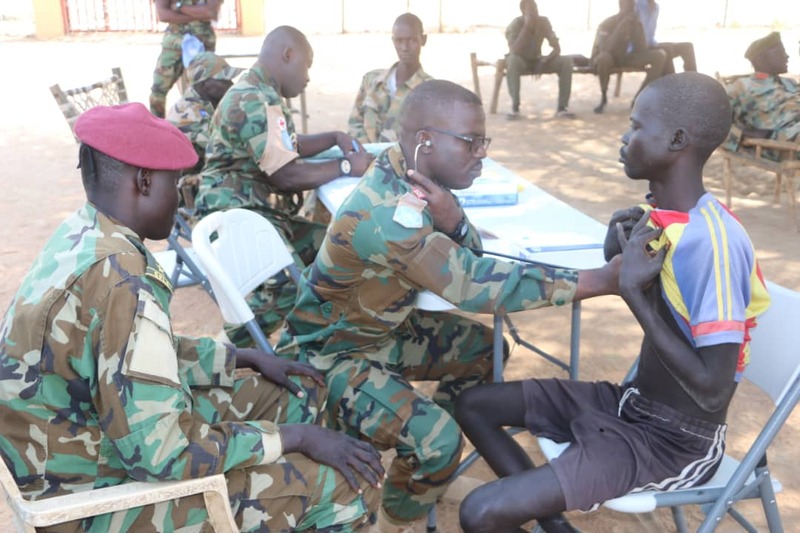 The Chief of Operations at the 3rd Division Headquarters, Col Akit Yai Rane, expressed gratitude to the medical team and the UN in general for the kind gesture and encouraged a peaceful co-existence between the SSPDF and UNMISS to the attainment of lasting peace in South Sudan. Concluding, Captain Maxwell Michael Asola-Fadola said: “The move is necessary if GHANCOY 1 is to chalk successes in accomplishing her mission in UNMISS, by winning the hearts and minds of the civilian populace in Aweil State and South Sudan at large. The Commander, Lt Col Felix Mautsueni, therefore, intends to carry out more Civil-Military Cooperation (CIMIC) activities throughout our tour of duty. 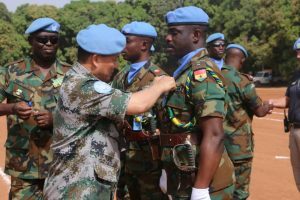 The post 150 Ghanaian troops in South Sudan awarded UN Peace Medals appeared first on Citi Newsroom.